A few weeks ago at a technology related press event I crossed paths with a representative from the Jamaica Gleaner who heard about my blog thanks to my pal Gordon Swaby and how I managed to visit Japan after launching Operation Visit Japan. Fast forward a few weeks and a couple more conversations later and today I please to announce that there is a short feature on my successful trip to Japan in today’s Youthlink Magazine which comes with the Tuesday Gleaner. 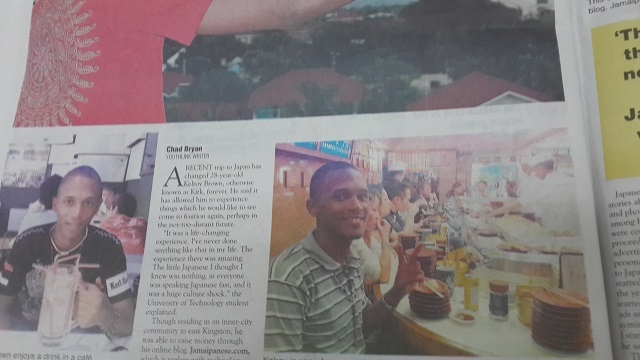 I encourage all my readers in Jamaica to pick up today’s copy of the Jamaica Gleaner to check out the feature. Readers in New York, London, Toronto and other cities with large Jamaican expat populations should also be able to pick up today’s copy of the paper. Visiting after reading the feature? If you are visiting Jamaipanese.com after reading about it in the Youthlink then I encourage you to stick around! Browse around the website and visit the about page to find out more about me. Check me out via the Jamaipanese.com Facebook page, @Jamaipanese on Twitter as well as my Youtube Channel. Feel free to leave a comment or contact me. I’ll update this post with a web link if/when it is posted on the Youthlink’s website! Operation Visit Japan was a mammoth task which you pulled off nicely! Congrats on being featured Gleaner Youthlink, thorouhly deserved! Pure Excellence!! I told Mum about your feature and she was like wooow. This was and still is awesome. You should definitely be proud of yourself. Its so good to have your hardwork & effort be recognized. Thank goodness for the encouragement from family & good peeps ! !